Last year, Natalia Vodianova was appointed ambassador of the FIFA World Cup 2018, which will be held in Russia. With only two years before the tournament, Natalia is starting to feel like sports cheerleader. She has a good reason. Today the Russian national team will play its first match at the European Championships 2016 in Paris, the rival of the team will be England. “Curious: England participated in the European Championship 8 times, but never won the first match. Let’s help England today to keep this tradition”, - displayed her support for the Russian team Vodianova. It is pretty easy for Natalia to decide what team she supports, but her eldest son Lucas, on the contrary, has a more difficult choice. The boy was born and raised in the UK and is a half-English, half-Russian. 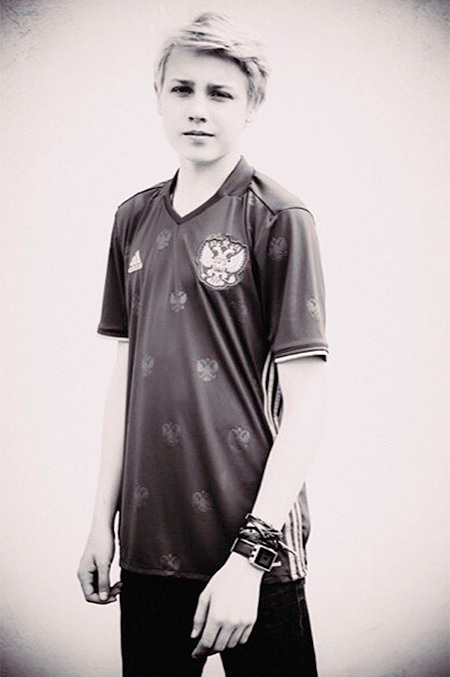 However, Lucas has already made his choice - a few hours before the son of Vodianova published on Instagram a photo, that shows him in patriotic T-shirt with double-headed eagle, and wrote: "Today in Marseille I support the national team of Russia”.